HTC's Touch Diamond, and its QWERTY'd doppelganger the Touch Pro, have formally passed into their second generation, with bigger screens, higher (WVGA) resolution, better battery life, and deeper interface changes. These handsets have always represented something of a standard to which WinMo phones are measured, and the tastefully restyled new versions, boldly called the Diamond2 and Pro2, play on their predecessors' strengths. The Diamond2 gets a screen upgrade, from 2.8in to 3.2in, with an accompanying resolution boost from VGA (480x640) to WVGA (480x800). The lauded TouchFlo 3D alternative interface now reaches a bit deeper into Windows Mobile 6.1, making a few more functions touch-friendly, but stopping short of a total overhaul. The most interesting new interface feature is the "Single Contact View", which consolidates your complete history of communication (texts, calls, emails) for a given contact into a single screen. A SD card expansion slot replaces the old model's fixed internal memory, which results in greater flexibility but severely diminished memory size on delivery (gone is the 4GB internal memory, replaced with the wimpy 512MB ROM) and a new 5-megapixel autofocus camera. The Pro2 is treated to most of the same upgrades. Its screen stretches to a full 3.6 inches, which is just .2 inches smaller than the monstrous TouchHD. It gets a louder speakerphone system and less-pixely camera than the Diamond2, but retains the larger battery and slide-out QWERTY keyboard that originally distinguished its dad from the Diamond. Battery life is apparently boosted by 50% on the Diamond2 and "improved" on the Pro2, a change which is more than welcome, as this is one of the areas where the original Diamond/Pro fell down. Other, less immediately interesting new features include "HTC Push Internet", which is essentially pre-loads parts of your favorite webpages, and the inauspiciously-named "Straight Talk", which allows for easy transitions between text or email communications and regular or group phone calls, letting you immediately initiate a conference call with, say, the recipients of an email thread. A few things don't sit will here—mainly the lack of internal memory and lost touchwheel—but anyone who has used the TouchHD knows that the enhanced resolution is a welcome change. And not to repeat an all-too-obvious grievance, but HTC fans have long said that the Diamond and Pro should have been the company's Android handsets from the get-go, so it's hard to avoid being slightly disappointed by Windows Mobile 6.1, again. BARCELONA - Feb 16, 2009 - HTC Corporation, a global designer of mobile phones, today unveiled two new flagship devices, the HTC Touch Diamond2ä and HTC Touch Pro2ä. Integrating innovative simplicity with unique style and an intuitive interface, the devices balance function, form and cutting-edge technology to personalize the communication and mobile Internet experience. Leveraging HTC's TouchFLO 3D experience combined with a people-centric communication approach and HTC's new Push Internet technology The Touch Diamond2 offers an advanced touch experience that is optimized for one-hand use. With fifty-percent better battery life, a five mega-pixel auto focus camera, expandable memory, gravity sensor and an ambient light sensor, the Touch Diamond2 brings the most sophisticated capabilities to a broad consumer audience looking for the professional benefits of a smartphone without sacrificing size, looks or functionality. Designed for business professionals, the HTC Touch Pro2 is architected with distinct style and strength while delivering the most powerful productivity experience available on a mobile phone. Leveraging HTC's TouchFLO 3D, people-centric communication and Push Internet technology, the Touch Pro2 features a high-resolution 3.6-inch widescreen VGA display for an expanded viewing area and large finger-friendly QWERTY keyboard. With improved battery life, expandable memory, a touch-sensitive zoom bar as well as gravity, proximity and ambient light sensors, the Touch Pro2 is optimized for touch as well as heavy email use. 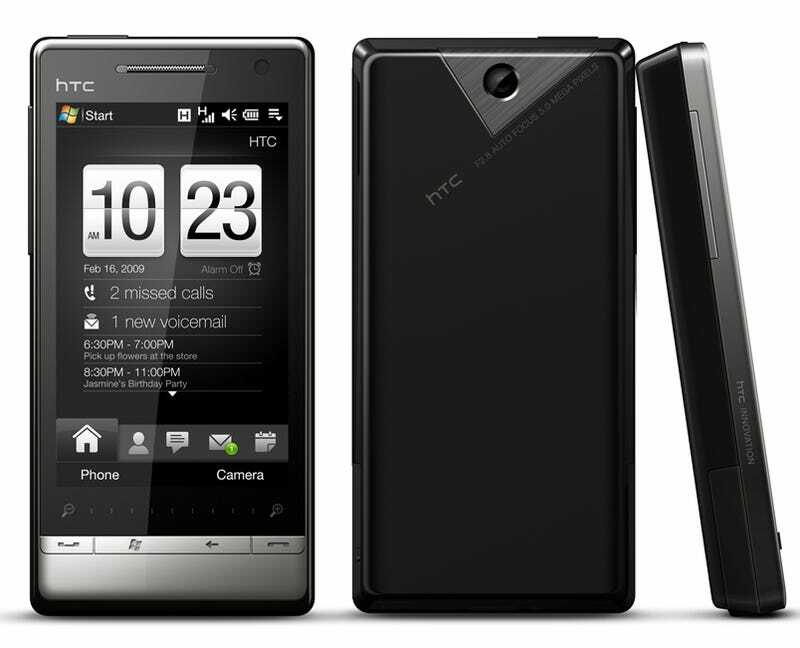 Founded in 1997, HTC Corporation (HTC) is a global leader in mobile phone innovation and design. Since its establishment, HTC has developed strong R&D capabilities, pioneered many new designs and product innovations and launched state-of-the-art mobile phones for mobile operators and distributors in Europe, the US, Asia and around the world. HTC is one of the fastest growing companies in the mobile device market. The company is listed on the Taiwan Stock Exchange under ticker 2498. For more information about HTC, please visit www.htc.com.